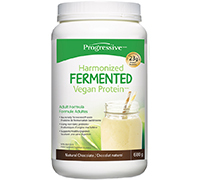 Progressive Harmonized Fermented Vegan Protein Powder is a premium blend of bacterially fermented legumes, grains and seeds. This formula is easier to digest and doesn’t cause gas or bloating. It also assists in building lean muscle and helps to support and maintain a healthy digestive system. Fermentation is a natural metabolic process that can help to improve digestion and reduce gas and bloating by decreasing anti-nutrient content and can increase nutrient profile with more vitamins (B & K), antioxidants, EFAs and amino acids. A blend of 5 non-GMO legumes, grains and seeds - Including Pea Protein Isolate, along with a custom blend of Organic Sprouted Amaranth, Quinoa, Millet and Pumpkin Seed for greater protein diversity. Suggested Use: Helps support and maintain a healthy digestive system. 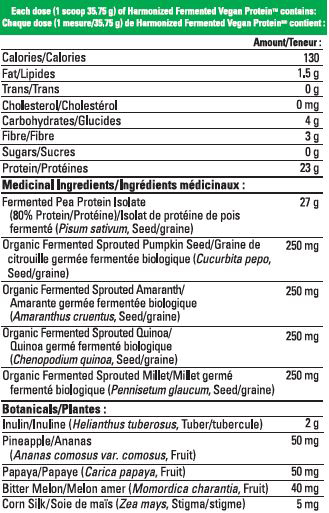 Suggested Dose (Adults): Mix 1 scoop (32.25 g) into 300 ml of the beverage of your choice. Consume 1 serving daily. Harmonized FERMENTED Vegan Protein can be enjoyed at any time of day including between meals or immediately following exercise.